New trainers make you run faster, didn't you know?! In a recent moment of madness I entered a half Marathon. Yes, this is the kick up the backside I need to up my cardio fitness and re-kindle my love with fair weather Summer running. With the entry therefore rose the perfect excuse to treat my feet with some Ascis love! I am adoring my choices in trainer so here's a quick write up of my thoughts on these beaut kicks! Firstly, the Gel-Kayanos (on the left)an absolute dream to wear. All the time! They are perfect for you over-pronaters and will 100% give you the support and structure you need to increase comfort and your running efficiency. Ascis reckon they "hug your feet and cushions the impact to make your 26th mile as comfortable as your first." And I have to agree. You feel totally light and bouncy and this colourway had me head over heels. I'll let you know how they bear up over 13 miles...! 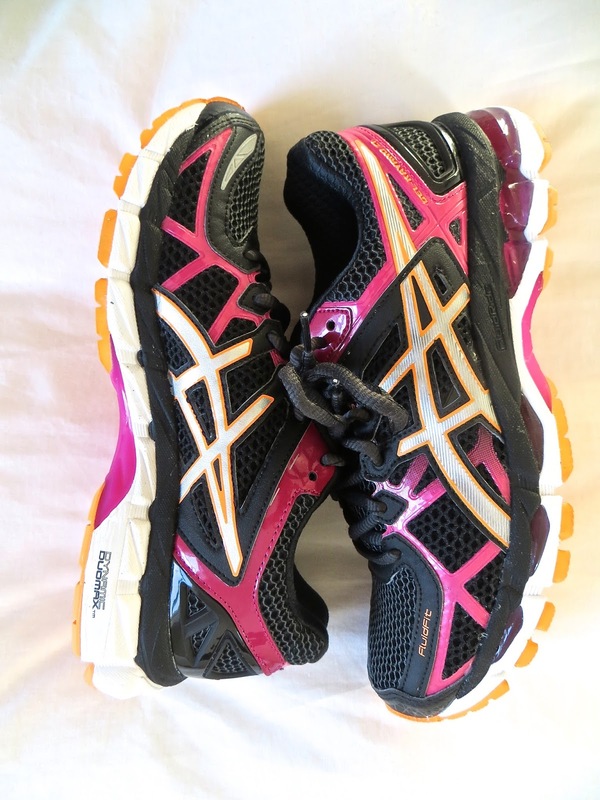 Next on my list (purely to spur on my training) was a new pair of cross training/gym class/ weight lifting sneaks. Sooo introducing the Gel Fit Tempo's! "Comfort and stability for any activity" is a pretty accurate description. Running more than 3 miles in them is a big no no, my calves ached baaad when I did, but for everything else they're a perfect fit. Flexibility, support and cushioning are just as you need them. I've found them to also be super breathable and flexible for high impact classes where agility is required!